Perfect activity for smaller areas. Encourage exercise for people of all abilities! Set up a game almost anywhere. Includes 15" hoop, 9" ball and hand-held pump. Improve coordination and target skills. Great way to get all ages and ability levels involved in this popular game. 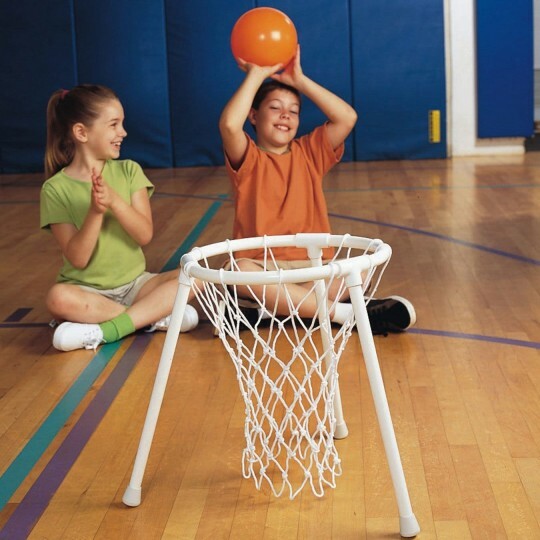 Helps develop a sense of competition and encourages physical exercise. Made from heavy-wall PVC pipe and has an official cotton net. Includes a 9" sport ball. 14-1/2"H with a 15" hoop. This is nice and portable to bring to our dayrooms for our elderly to play basketball. Perfect for range of motion eye hand coordination great sportsmanship funteamwork etc. Great conversation builder laughter about making it into the basketball hall of fame which is the next town over from us! Best purchase made! I bought this to use with a group of senior citizens. They love it. Only problem was when I received the product it was hard to un-tangle the net and the pump for the basketball came without a needle. Once I figured out to un-tangle the net and found a needle to pump up the basketball everything else assembled easily. It is easy to transport and my group loves playing it. All of our residents--male and female--love this! It's a change from the traditional ball toss in a circle and creates some competition among the participants! The difficult part is making sure the hoop isn't too close or too far from the resident who is tossing the ball--we want to make sure that it's challenging enough but not so challenging that it creates frustration.